Aquapark is a substantial waterpark located in Costa Teguise, Spain. It's the biggest waterpark in Lanzarote and comes equipped with many incredible slides, rides, plus a plethora of other amazing activities. Who is the waterpark best suited to? What to wear to Aquapark Costa Teguise? Aquapark is home to some of the best slides you'll find in Lanzarote, as well as many other activities that the whole family can enjoy including paintball, birthday parties, a cinema, kids' go-kart facilities, plus much more! You'll find an abundance of incredible waterslides located throughout the waterpark complex, as well as plenty of small pools suitable for children, kids' slides and activities and a jacuzzi where you can enjoy a leisurely relax while you keep an eye on the children! It is Lanzarote's biggest waterpark. There's free Wi-Fi located throughout. It's ideal for every member of your family as there's so many different activities to enjoy. There are two huge waterslides named ‘Kamikaze' and ‘Super Kamikaze'. Aquapark Costa Teguiseoffers an annual summer camp for kids between the ages of 4 and 14. It's home to the only indoor Paintball area in Lanzarote. Get a return bus ticket to Puerto del Carmen and Playa Blanca from just €4. Make full use of the on-site photographer who can take pictures of your time at Aquapark so you can take home souvenirs of your experience there. Even if you're not a big fan of waterparks and water, you can still have an amazing time at Aquapark's on-site family 10D Cinema. There are first aid qualified staff and lifeguards on hand at all times throughout the waterpark. Aquapark Costa Teguise really is suited to everyone in your family; from tiny babies who can enjoy lounging in the children's lake accompanied by their parents, all the way up to senior citizens who can take it easy in the jacuzzi and sunbeds that are situated throughout the waterpark. There are numerous zones specifically suited to younger children, including the children's lake, game castle and children slides. 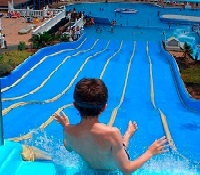 You'll also find slides, attractions and activities suitable for teenagers and adults as well at Aquapark Costa Teguise. As well as having plentifulwaterslides and amenities for the whole family, Aquapark Costa Teguise also boasts many other impressive features and facilities. Below you can find a list of the top 10 things to do in Aquapark Costa Teguise. One of the best waterslides to enjoy at Aquapark Costa Teguise is either the Kamikaze or Super Kamikaze. These slides are similar in length and offer an adrenaline-fuelled ride into a base pool at the bottom! They're ideal for thrill seekers and you're sure to have an incredible time whizzing down them and causing a splash at the bottom. The Turbolancha is just one of the spiral waterslides at Aquapark Costa Teguise and is ideal for those looking for a thrill, but a slightly less terrifying one than what Kamikaze provides! 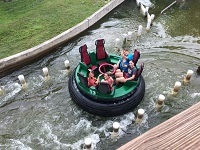 The Rio Loco Rapids aren't quite as scary as they seem; they're a sort of lazy river that you float around on a rubber ring and you can enjoy swirling around in the water as you're carried around by the current. The Game Castle isn't part of the waterslide area and is set just a little back from the pools and slides at the edge of the park. It's ideal for children under the age of 8 years old and is a great place for them to play if they're not a huge fan of the water. One of the incredible amenities that you'll find at Aquapark Costa Teguise is their Paintball facilities. It's the only indoor track in Lanzarote and you is an activity that's recommended for groups of visitors to the park who want to unleash their competitive side. You can choose from team duel, capture the flag, VIP, against all odds and last man standing; there's a vast variety of games to choose from to suit everyone's needs. To use the Paintball facilities, you'll have to pay an extra €15 (€12 if you're a resident of the Canary Islands). The price of your Paintball ticket includes all the necessary equipment and 100 balls. For a truly unforgettable experience during your time in Costa Teguise at Aquapark, you need to pay a visit to their very own cinema; Cinema 10D. Unlike a normal 3D or 4D cinema experience, at Cinema 10D, you'll experience 10 different sensations while you watch one of the vast selections of movie listings appropriate for the whole family. Aqualancha is a very similar waterslide to the Turbolancha in that it spirals around a few loops and then casts you into the pool of water at the bottom! The Children's Lake section of Aquapark is a large kids pool equipped with splash zones, a rocket feature and tiny baby slides suitable for much younger children. The jacuzzi is situated close to the children's splash zone so while you relax and enjoy the hot bubbles, you can keep a close eye on the children. For the competitive families paying a visit to Aquapark Cost Teguise, you're sure to enjoy racing each other down the waterslides on Aquaracer. There are multiple slides, all the same length which will send you whizzing into the pool below. Aquapark Costa Teguiseis open all year round, with rides and slides closing approximately half an hour before the whole park closes. There are numerous convenient ways to get to Aquapark Costa Teguise, regardless of where you're staying in Costa Teguise. If you've rented your own car while staying in Lanzarote and wish to drive yourself to the waterpark, then you'll be delighted to know that there's free car parking at Aquapark Costa Teguise. Arrecife Bus services are available throughout the city and make regular stop offs at Aquapark Costa Teguise. Depending on where you're staying, you'll either need to Arrecife, Puerto del Carmen or Puerto Calero bus service to take you to and from Aquapark Costa Teguise. Another great feature of Aquapark Costa Teguise is that they have their own bus service that operates from 9am until 5pm and will pick you up from various pick-up points and hotels on the island. Prices for these bus tickets cost only €4. Only swimming costumes made from lycra and appropriate swim clothing fabrics may be worn in Aquapark waterpark. You should also remember to bring appropriate footwear such as flip flops to walk around the park in as the floor and tiles can get very hot during the height of summer and peak season. It's also advisable to bring plenty of sun cream with you when visiting Aquapark in order to prevent you and your family from getting burned from the sun's harsh rays, especially during the summer months. Swimming costumes, bikinis and swim tops are permitted in Aquapark, but no outdoor clothing must be worn at any time. Accessories such as watches, necklaces, bracelets, Go Pros and other camera devices are not permitted for use on the waterslides. However, if you do want to get pictures of your time at Aquapark, make sure you make use out of the on-site professional photographer who can take pictures of you, ready for collection at the end of your day. It is prohibited to take your own food and drink into the waterpark but there are numerous on-site facilities where you can stock up on plenty of snacks, refreshing drinks and delicious ice creams! The on-site restaurant at the waterpark serves everything from sandwiches to pizza to hot dogs, as well as plenty of refreshingly cold drinks so you'll go never thirsty at Aquapark Costa Teguise! As well as the restaurant, there is also a regular shop and a coffee shop at Aquapark Costa Teguise where you can stock up on plenty of food, drinks and snacks to keep you going throughout the day. As well as the standard restaurant where you can find plenty of food and drink to sate you throughout the day, Aquapark Costa Teguise also has plenty of other services and facilities that you can make use of while you're there. There are several types of tickets on offer at Aquapark Costa Teguise, including adults and children admission, half day tickets, as well as discounted tickets for Canary Island residents. "Our first time in Lanzarote, what an amazing experience!" "Great day out for the whole family when in Costa Teguise, Lanzarote!" "Loved the waterslides and the lazy river!" 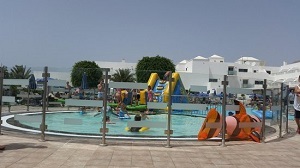 "Aquapark was the highlight of our holiday to Lanzarote, the whole family loved it!" Below you can find some of the rules, regulations and things you should know about before you visit Aquapark Costa Teguise. You must present your ID card or Passport for card payments. The swimming pools are not heated. You are not permitted to bring your own food or drinks into the park. For reasons of hygiene, it´s necessary to use swimming wear in all the attractions and swimming pools. The use of the attractions is forbidden for pregnant women. Children and adults cannot use the slides together. For individual use only. 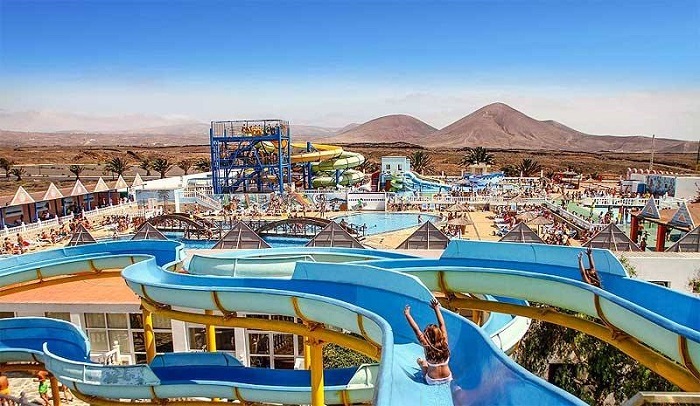 As Aquapark Costa Teguiseis the largest waterpark in Lanzarote, it's no surprise that's it's incredibly popular with both tourists and locals. Below you can find some of the best customer reviews on what people have to say about their experience at Aquapark Costa Teguise. "We had an absolute ball! Will definitely be back for more!!! One attraction in Lanzarote NOT to be missed!" "A great water park for all the family." "We spent a few hours here on our holiday, was well worth the money. No queues and the slides are fun and would appeal to many ages." "We really enjoyed our day at the aqua park and thought it good value for money. €5 in a taxi from Costa Teguise. Lots of good slides and loads of sunbeds." "This is the best water park on the island. I've been to the other one and this one is so much better. They have so many slides!" Wherever you're staying on the island, it's remarkably easy to get to Aquapark. You can drive yourself there and park in the free on-site car park, or you can use the Aquapark bus service that runs from Puerto del Carmen, Puerto Calero and Arrecife and only costs €4. The area of the waterpark at Aquapark Costa Teguise can get incredibly hot in the sun, especially during the height of summer so it's advisable to remain as covered up as possible. You should also bring plenty of sun cream with you and make sure you've always got some on as the sun rays can get intense during the day. While you're not allowed to bring your own food and drink into the park, there are plenty of facilities located throughout the waterpark where you can purchase drinks, snacks and ice creams. There's an on-site shop, restaurant and coffee shop that can cater to all your dietary needs! If you're visiting Costa Teguise for a few days or on a week-long holiday, you'll be pleased to know that there are also plenty of other things to do near Aquapark as well! Lanzarote Aquarium is one of the best things to do in the area near Aquapark; it is an aquarium home to many marine life species including tropical fish, sea turtles and even an underwater viewing tunnel where a plethora of sharks circle above your head! This beautiful beach is home to a great range of water sporting activities including windsurfing and body boarding! If you're not a fan of more extreme water sports, you'll enjoy relaxing and chilling out on the sand. Playa de las Cucharas is another beach that's not too far from Aquapark and is a great beach for sunbathing, swimming and snorkelling as you'll often find small marine life circling along the shore. For those who are fascinated by Spanish history and architecture, you'll want to pay a visit to Castillo de San Gabriel; a fortress that looks out on to the sea. The Royal Residence of La Mareta is a Spanish royal family residence in Costa Teguise and has also been used as the holiday home for numerous Spanish Prime Ministers. You can wander around the outside of the Palace, or you can book tickets to enjoy a tour of inside too. Aquapark Costa Teguise is a brilliant day out for the entire family and is home to a plethora of wonderful waterslides, pools, Paintball activities and even a cinema! It's a must-visit place when you're staying in Costa Teguise, Lanzarote and you're sure to have the most amazing time riding on the many waterslides, river rapids, as well as enjoying a 10D experience at the Cinema 10D movie screen!